I am a south Indian by birth, but I have spent almost all my life in the northern states of this beautiful and diverse country. When I used to go to my hometown during my childhood days, I used to see young women wearing what is often referred to as a davani. What it essentially is a long skirt, worn with a blouse and then a dupatta is draped over the blouse, with one end tucked into the skirt. The dupatta would always be pleated neatly, earning it yet another name – the half saree. Today, most people are referring to it as the Indian lehenga saree! Although the humble davani or half saree has been around for centuries, the more modern version has appeared on the scene recently. As a matter of fact, the designers who reinvented this age old attire need to be given a salute, because they have managed to combine a sense of the modern with something that is so inherently traditional. Go to a store that offers traditional attires and chances are that you will get to see several versions of the lehenga saree – there will be ones with elaborate blouses and simpler lehengas, ones that are vice versa and then also versions which have intricate work on the dupattas. 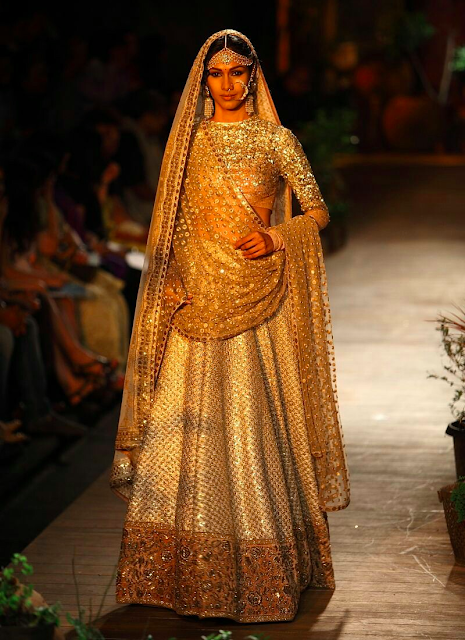 There was once a time when a wedding meant buying a traditional Indian bridal lehenga choli but the modern day bride wants something a little more unique and a lot more exclusive. This is perhaps why, many of them are looking at the lehenga saree instead of the traditional lehenga choli. One of the reasons why a lot of women are considering the lehenga saree is the fact that it allows for a lot more experimentation. A saree means that all you can do is change up the way you drape it, and with a lehenga choli there are only so many designs that you can choose from. However, with the lehenga saree, you get the best of both worlds. If you are looking at investing in an Indian lehenga saree it would be a good idea to look through a fair few options, before picking one that you like. Consider factors such as the material, which should be in keeping with the climatic conditions, the work done, which should be dependent on what the occasion is and of course the price tag. It is also important to remember that you should pick something that will suit your body type and your skin tone.